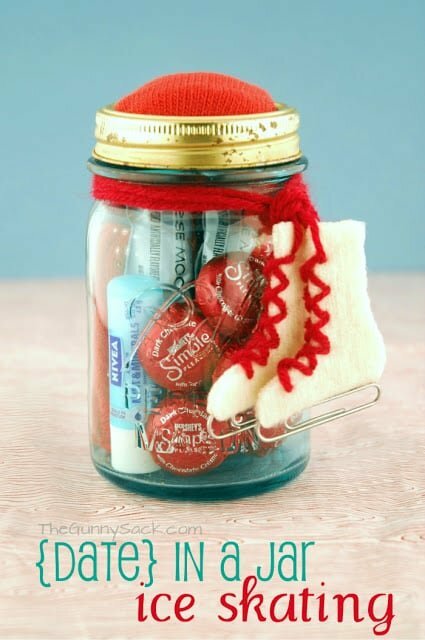 This handmade gift idea is a Pedicure In A Jar. I gave these cute mason jar gifts to my girlfriends this summer. Earlier this summer I went on an annual girlfriends getaway weekend. I have been friends with the ladies I went with for most of our lives and my friends are truly a gift from God. Life gets so busy and there were a few years where we didn’t see much of each other. Finally, we decided to plan a yearly getaway for just us girls so that we would be sure to make time to stay connected. We’ve been going on these getaways for 13 years now. So far, we haven’t gone anywhere that involves an airplane but we keep promising that will happen one of these days. I wanted to give my friends a small gift just for fun and decided to make a Pedicure In A Jar. The supplies are basic: a mason jar, small containers, pedicure tools, a ribbon, labels and the spa treatments. I used a vintage pint sized mason jar, Spare Parts plastic storage tubes from Hobby Lobby, nail care tools from Trim and chevron print burlap ribbon from Hobby Lobby. Cut out the labels and glue them to the containers. 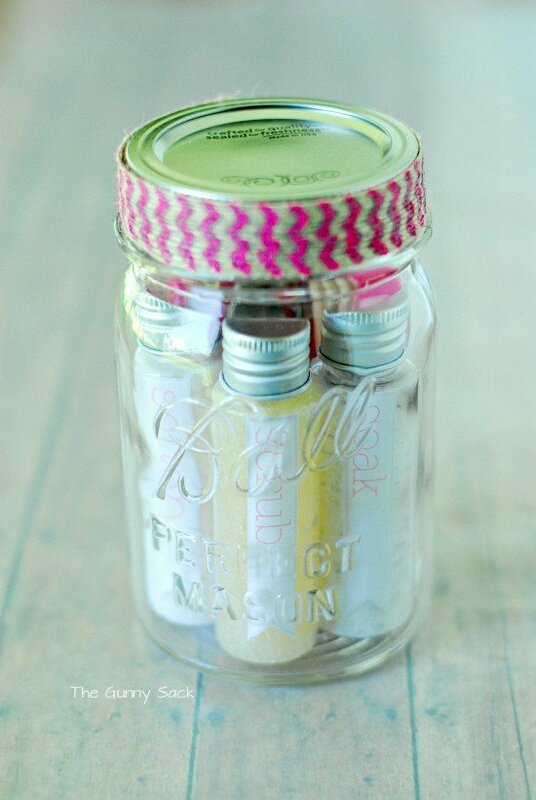 Remove the nail care set from the package and fill the mason jar with all of the supplies. 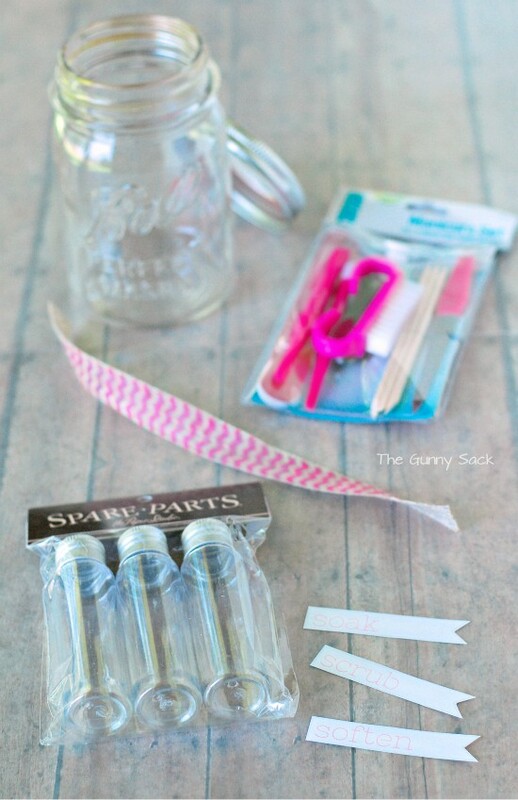 Add some ribbon to the top of the mason jar and it is ready to go! 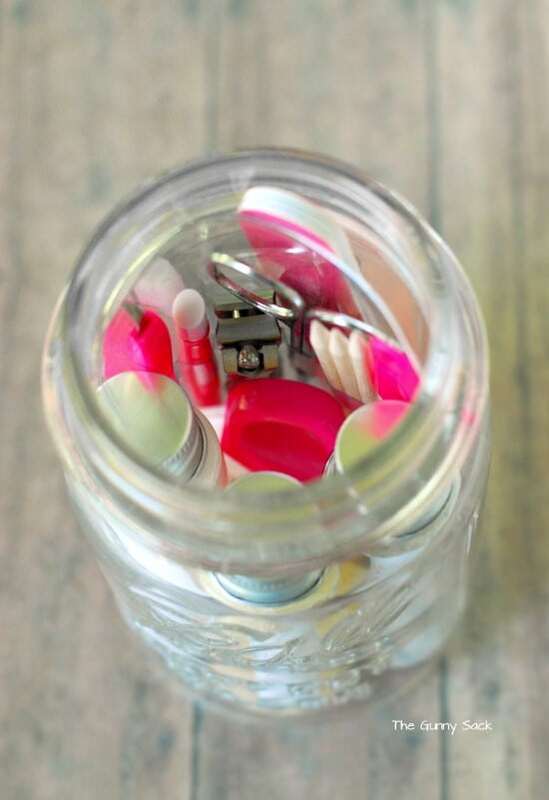 I know you posted this pedicure in a jar quite some time ago but I was wondering if you could tell me what size the storage tubes are. I can’t find the brand “Spare Parts” any longer. Do you mean the recipes I linked to in the blog post? Very cute idea! You could also print your labels on sticker sheets instead of glueing the labels on. Thanks for your idea. Wow, I’m seriously impressed with what I’ve seen here. I decided that I wanted to give some home crafted gifts this year but wasn’t too sure on what to do. After visiting your sit, I am really inspired. Thank you so much for sharing and keep up the great work. Love everything on your site! Esp all these gifts in jars.Thanks so much for sharing. You are brilliant! Love, love, love these!! 🙂 You are amazing! 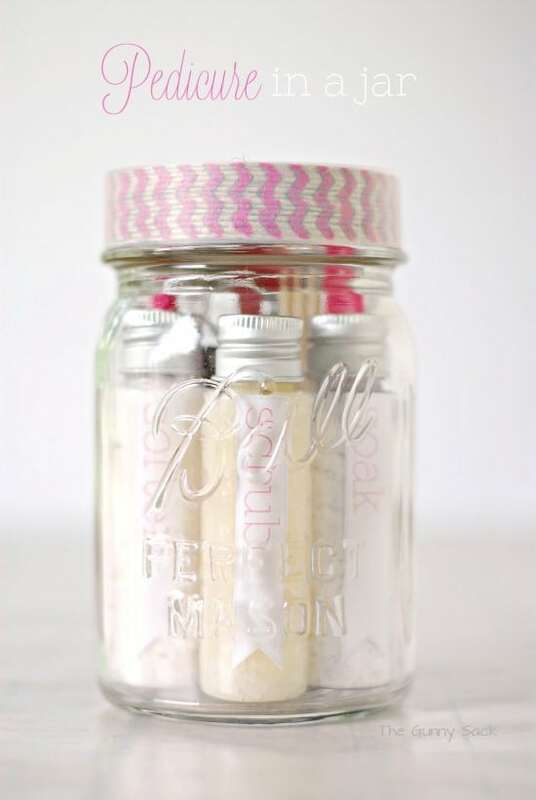 Wondering what size jars were used for the gifts in a jar? Hi, Tonia. I absolutely love these! 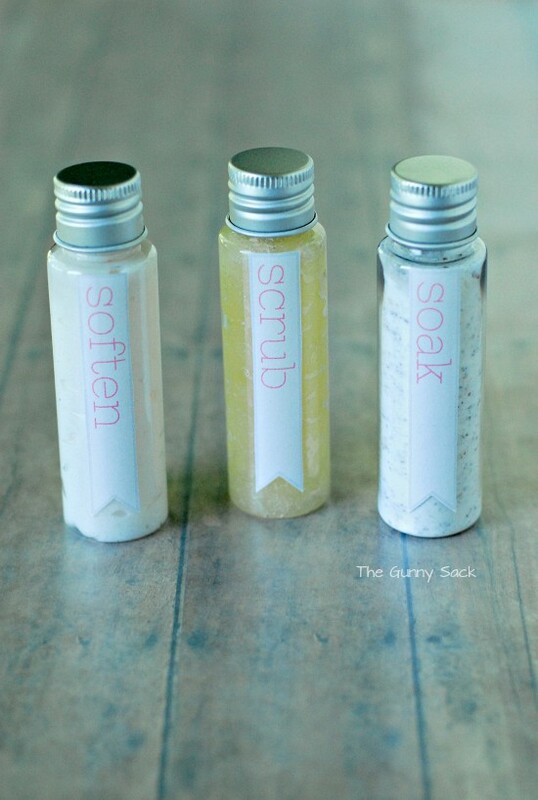 I want to try and make the foot scrubs. I was wondering if there was a specific way to store the scrubs. Room temperature or fridge? Thanks! I store it at room temperature as I do with my coconut oil. Best of luck! These are wonderful! I’m currently planning a baby shower and these pedicure jars are perfect “games gifts”, with an added pink nail polish to tie in the girl baby theme. If you don’t mind me asking, where did you happen to get the nail grooming kit?? Thanks!! Thanks Jamila! I got them from Walmart. Best of luck with the baby shower! I love, love, love this idea!! The tubes from Hobby Lobby are so cute with the labels! Such a genius idea…totally love it!! 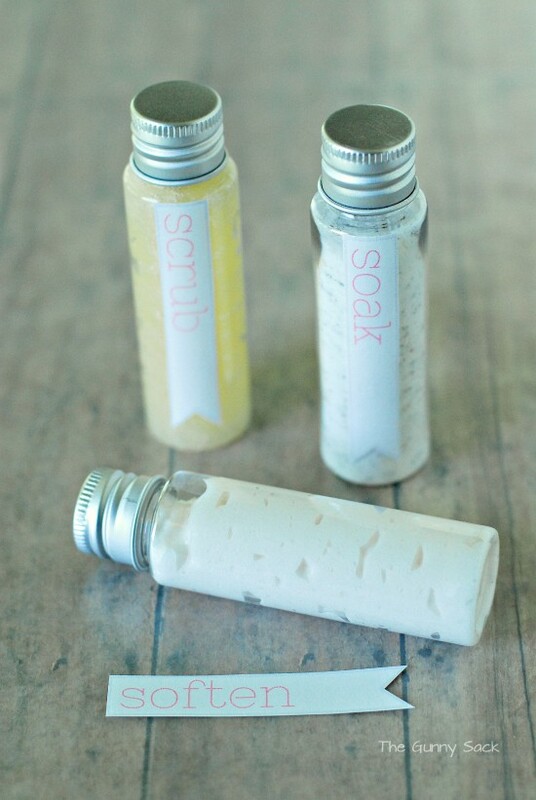 This would be such a cute hostess gift at a baby shower! So fun and the labels are cute! This is just too adorable Tonia! You are so creative! 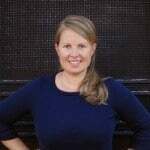 Tonia everything you do is amazing! I love this idea!! Fun gift idea; perfect for Mother’s Day! Where do u get the smaller containers ? The Spare Parts plastic storage tubes from Hobby Lobby. Thanks for stopping by! How darling is this?? I bet your friends loved their gifts! Awesome idea, Tonia! this is so nice! 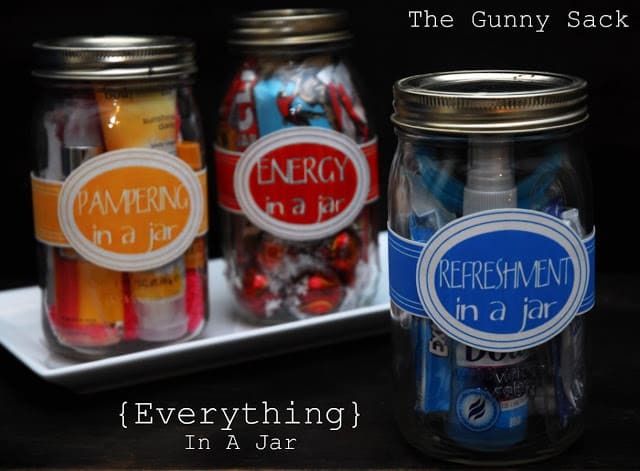 I wouldn’t mind any something-in-a-jar gift, haha! 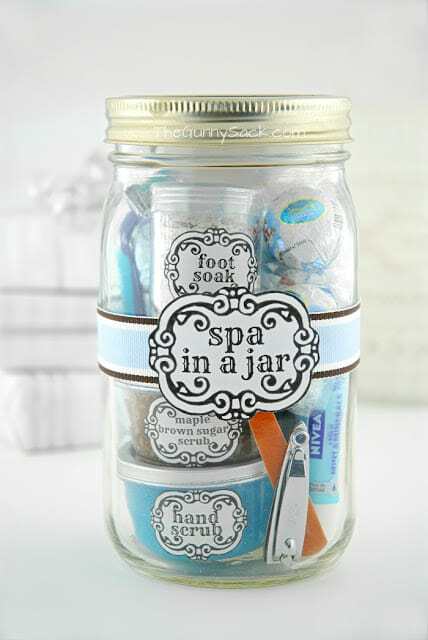 Pedicure In A Jar ~ Mason Jar Gift. Tonia, those are so cool. I have to share this with my Face Book family & friends. Thanks, Anna! You are a total sweetheart!